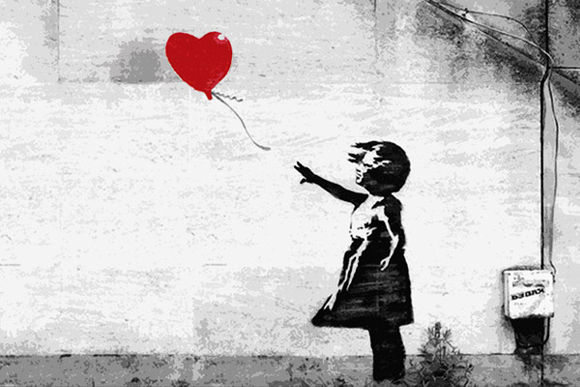 Banksy’s Girl With A Balloon is one of his most recognizable works. With two simple shapes, one burst of red, and a short faded statement, “There is always hope” Banksy is able to leave an impressionable mark on viewers of this artwork. The little girl is painted in black and white, with little detail, making her a universal subject matter. Her heart shaped balloon pops brightly, signifying hope. Here, Banksy creates a metaphor than can resonate with almost anyone who is struggling or has struggled. When everything appears to be black and white, there is always a glimmer of hope pushing you through. Children have a sense of excitement that often fades with time, but here Banksy reminds everyone to hold onto that innocence that can often lead to imagination. This imagery was first spotted in 2002, in London’s West Bank, stenciled atop a washed up wall that passed by many pedestrians daily. What makes this particular graffiti so eye catching and memorable is its ability to speak a message in mere seconds. Even without reading the words that are faintly painted to the side of the image, there is a clear motif of hope. Although this image is simple, Banksy does leave a fair amount up for interpretation. The girl can be viewed as either losing the balloon or reaching for it. In the interpretation that she has lost grasp of the balloon, the loss would symbolize that the girl is losing her innocence. In the opposite interpretation, one could recognize that children always think big- even if it means grasping onto something that is out of reach. 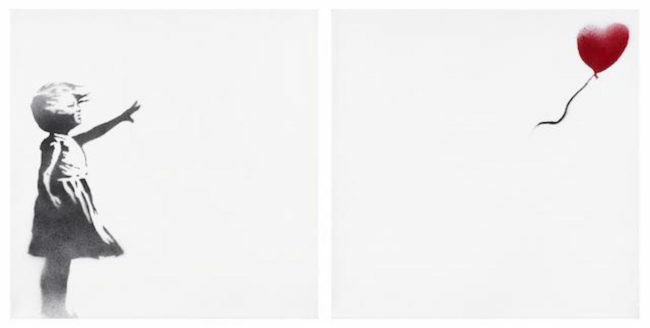 Likely, Banksy created this dual interpretation intentionally to evoke the viewer’s personal view on hope. 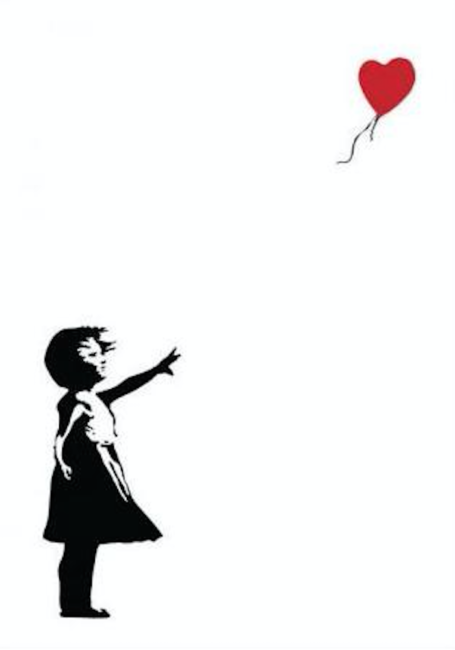 Balloons signify happiness- and Banksy makes that very clear by making it the only aspect of the image that has color. Balloons often remind us of happy occasions and celebrations. When inflated, balloons only go up- but after a short amount of time they deflate and go down- an unavoidable occurrence. This mimics the behavior of a child’s imagination. A mind that pushes beyond limits, but then eventually hits a point of adulthood and loss of that innocence. While all of Banksy’s creations share a bold message, this one in particular has left such an impression on society, because of how universal it is. He captures a feeling that everyone has experienced at some point, and reminds people of hope.